Seven months later, the high court acquitted him. It said that key evidence - including testimony from a policeman who had since died - was not reliable. One of Bollywood's biggest stars, the actor has appeared in more than 100 films and has a huge fan following across the vast spectrum of Indian society. The eldest of the three sons of well-known screenplay writer Salim Khan, he is a hit on social media too - his Facebook page is liked by more than 36 million fans, while on Twitter he has 32.5 million followers. 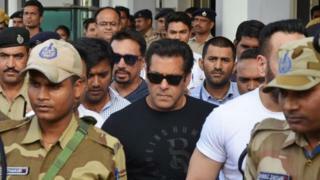 Every day in the Mumbai suburb of Bandra, fans flock to Salman Khan's apartment building to catch a glimpse of the Bollywood actor. Khan's conviction is making waves on both mainstream and social media. Some celebrities, including friends of the actor, took Khan's side. According to the State of India's Environment, the report published annually by the country's Centre for Science and Environment, there was a 52% spike in poaching and wildlife crimes between 2014 and 2016. More than 30,382 wildlife crimes were recorded in the country during that period.